The Memory Craft 9900 lets you take your creative expression in any direction you can imagine. All the best features are here for embroidery, garment sewing, home décor, fabric crafting, and more.All in a machine that's just the right size for any sewing space. What you see: You can change the face panel on the MC9900 to customize how it looks. What you don't see: You can also change many of the settings on the machine to customize how you like to sew. Changing The Face Panels - It's easy. Just pop off the panel on the machine and pop on the new one. The MC9900 comes with three panels to choose from. Choose your color! You can adjust the contrast of the visual touch screen to suit the lighting in your sewing room. Change the background color of the screen to match your current face panel. And if you feel the touch screen is not responding properly, you can easily recalibrate it to your personalized pressure points. Adjust the sound volume to make machine alerts louder or quieter, or mute them altogether. You can also set your machine’s measurement unit to either inches or millimeters. The default unit is millimeters. The Standby Timer determines how long the machine will wait before going into standby mode. The sewing lights will turn off, the visual touch screen will go dark. Doing any operation will turn the lights and screen on again. The standby timer can be set from 1 to 30 minutes. Or if you wish, you can shut off the timer completely. You can adjust the auto thread tension up or down. You'll want to increase the value when using the same thread in the bobbin and needle. The low bobbin thread warning level can be adjusted to give you more or less of a grace period before you run out of thread. Set the level to 3 or 4 when using thick threads for stitching lace designs or quilting. You also have the option of turning this warning completely off. One stitch stop on/off: When this function is turned on, the machine sews one stitch and stops automatically so you can bring the bobbin thread up before sewing. Consecutive color grouping options: If an imported stitch data file or design files of a pattern combination contain consecutive sections in the same color, these sections are automatically grouped together as one section when opening the file or saving the pattern combination as the file or going to the Ready to Sew window. You can turn off this option if you do not wish to group the sections together. Auto thread cutting: When this option is turned on, the machine automatically trims the threads when it stops to change the thread to the next color. You can set the cutting length of jump threads. The adjustable range is 3 mm to 30 mm or it can be turned off. Customize your machine's color numbers to the brand of embroidery thread you're using. There are 8 brands from which to choose. The color code of the selected brand is shown on the Color/Part key along with the name of the color. When this option is turned on, the machine automatically trims the threads after sewing locking stitches. The Favorite Stitch Adjustment option lets you save the changes you've made to manual stitch settings. This option is available for all stitches except monogramming in ordinary sewing mode. When you begin sewing a stitch, the machine will start running slowly and the sewing speed will gradually increase to maximum. You can select the desired start-up speed as slow, normal or high. And you can set the start-up speed for the start/stop button and foot control independently. The machine always stops with the needle in the Down position except when sewing buttonholes, specialty stitches, monograms, etc. However you can change the needle stop position to Up by pressing the needle up key. 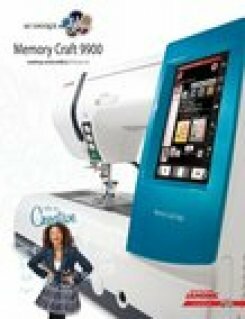 The Memory Craft 9900 Embroidery Machine is an awesome machine. You will be amazed at how beautiful the designs and stitches are on this machine. Come in today for a demonstration. You won't want to miss out on this opportunity!